Check out this Star Wars fan. I found this pic on Facebook today and thought I would share it here. Does the X-Wing helmet fit her? Who wouldn't want her as a co-pilot in a snowspeeder? Being SW fans, are we looking at her because she is wearing a SW uniform or is she just that good looking? Share your comments below. Talk about a figure that was hard to find when it was released. This figure took awhile to hunt down in the wild but I eventually scored one at retail. I kept seeing this figure for $20 or more at collectors shops. That is just rediculous! Anyways, Bastila Shan has made her way to the DSP.net Toy Gallery. Bastila Shan was a Human female who served as a Jedi Knight during the Jedi Civil War. Born on the planet Talravin to Helena Shan and a treasure hunter, her mother gave her up to the Jedi Order, believing that their lifestyle of travel and exertions was not suitable for the young Shan. Shan was found to have an exceptional gift with a Force power known as battle meditation; which increased her allies' morale while demoralizing her enemies. Shan sided with the Jedi Council when the Jedi Knights Revan and Malak rebelled against the Council and joined the Galactic Republic in its war against the invading Mandalorian Neo-Crusaders. Ever wondered what the figures would look like if they were ever made from this scene in A New Hope where Jabba was originally a human? 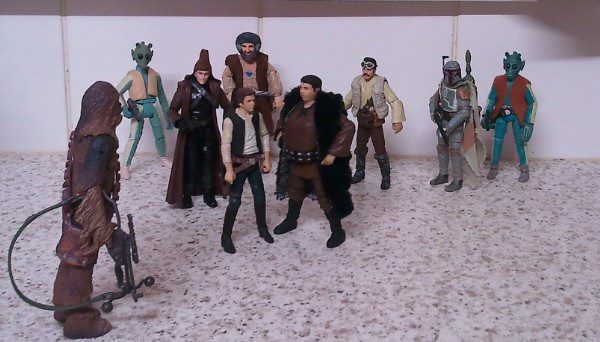 Well Facebook customizer Colin whipped up a few really awesome looking figures for the the original scene when Han Solo talks to Human Jabba. Click here to visit Colin's Customs Facebook page. His work is outstanding. 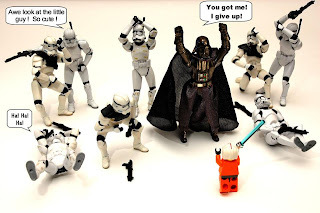 Fun With Figures: Don't Shoot..
Today's funny figure pic was found on facebook. I will post these types of images as I find them. Enjoy! Check out Zipidi Doodah's Hoth Diorama on Facebook. It's a 3 3/4 in. scale, in a room 16'x16'. He created a set up that is 96 sq ft. 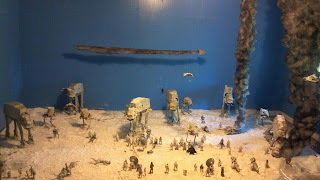 The most creative part of this layout is the bellowing smoke from the wrecked walkers. There he used poly fill and is cotton free. Very nice work! Click here to view his facebook page to see more. 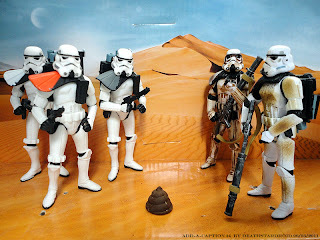 SW Babes: Are these the Droids?.. Yes, today is my 38th Birthday and I have been collecting Star Wars toys since I was 5 years old. So that is 33 years of being a Star Wars fan. If you want to send me cash as a gift for some more toys, I gladly accept Paypal at my email Dsdroid@yahoo.com email address. 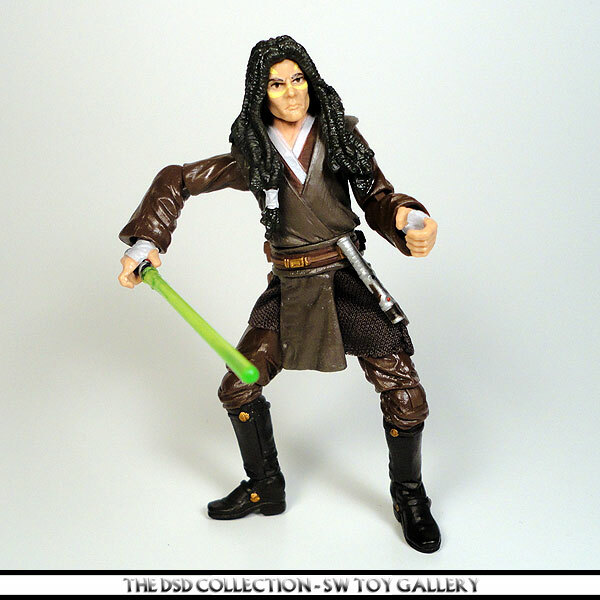 :) I promise I will buy SW figures with any contributions and add them to the Gallery. 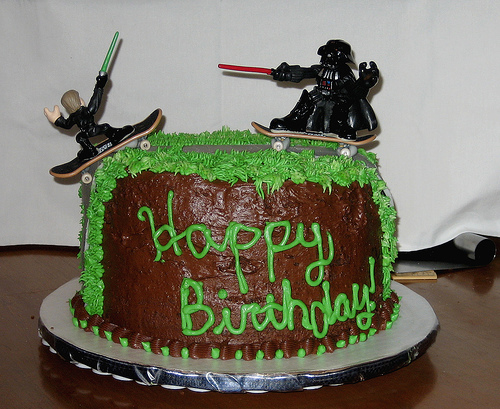 Special Thanks to everyone on Facebook for wishing me a Happy Birthday today. Introduction: Finally, Hasbro delivers with this monster sized vehicle called the Millennium Falcon. Wow, what a huge ship you have there. This giant beast can hold many figures and can be used to recreate many of your favorite scenes from the movies. It also comes with many new features of playability. Just an amazing ship! My Opinion: Took me awhile to get one of these BMF's but I waited til I got mine on clearance for 50% off at ToysRus. I had to track one down after visiting 3 stores that were sold out when the sale price hit. Once I found one though I was stoked, this ship is a must have for any collector even if you only collect the figures. This vehicle comes packed with so many features its unreal. Even at the full retail price it is worth picking up. These days you're probably going to have to pay a little more now but it will still be worth the money spent as this things looks so sweet on display. You must look through my full gallery of images to see how much fun I had with it. "The fastest ship in the galaxy, the Millennium Falcon has amazing speed and firepower that helped the Rebel Alliance defeat the Empire in numerous battles, including Yavin and Endor. Piloted by Han Solo and Chewbacca, the Falcon packs powerful secrets and special modifications inside and out. They all came in handy on that fateful day when Han and Chewie agreed to fly Luke Skywalker, Obi-Wan Kenobi, R2-D2, and C-3PO to Alderaan, and ended up battling the evil Empire for the 1st time. As Han Solo says, "She may not look like much, but she's got it where it counts, kid." "
Introduction: Back in 2002, Hasbro re-released the speeder bike again along with an awkward looking Clone Trooper with removable armor which was again re-released during the Clone Wars line but with a gray color instead of the standard brown color. 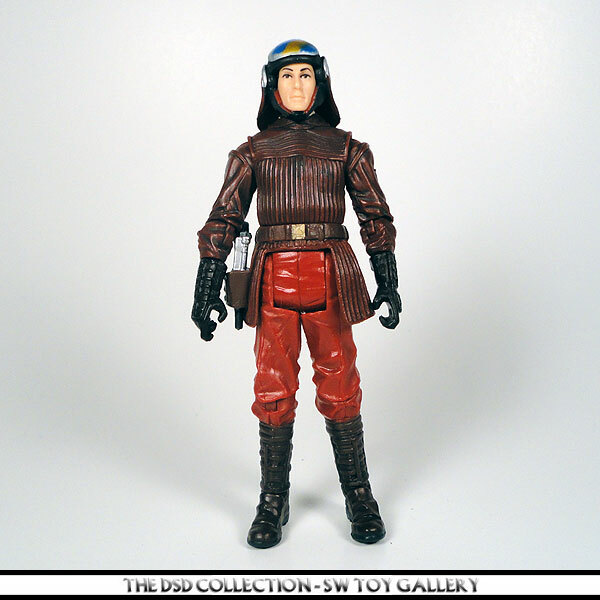 This speeder was released in the deluxe line on a card back and blister style packaging. "Formidable fighters engineered for battle, a number of the Clone Troopers are deployed on speeders, then race into battle against the enemy forces. Daringly flying alongside the AT-TEs, they lob electro grenades into the vehicles to disable them in crippling explosions." 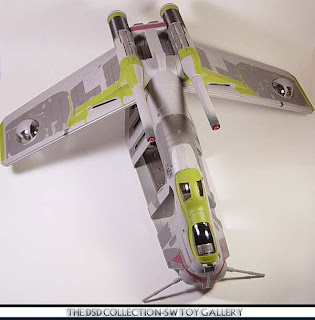 Introduction: The green AT-AP walker is repaint of the 2008's TAC AT-AP Walker and the third time it has been released. The second was just a repack of 2008's TAC AT-AP Walker. This repainted version is by far more superior looking that the original release. AT-AP stands for All Terrain Attack Pod but I am sure many collectors already kn...ow that. My Opinion: I never picked up the original so this was a real treat to find repainted so I had to pick one up. Now I want the old one too for comparisons. The cartoonish clone troopers make a tight fit for the gunner cannon so I don't think a regular figure will fit to well up there. However, the back of the seat is made of a flexible plastic so it can me pushed back to fig a figure in snug. How many of you actually own both versions? "Designed as mobile battlefield armor, the All Terrain Attack Pod is an essential walker for the clone troopers. The center leg gives the AT-AP additional stability for crossing rough terrain, as the clone troopers who operate it blast the enemy with the vehicle’s projectile launcher and cannons. AT-AP walkers were used on Ryloth to liberate the Twi-Lek people from the separatists." A double double update! Here is the second of the Pod Racer two packs that are making their first debute as action figures including their useful Pit Droids. Although this is probably the most hidious looking figure so far, we still needed it made to complete the entire Pod Race entries. 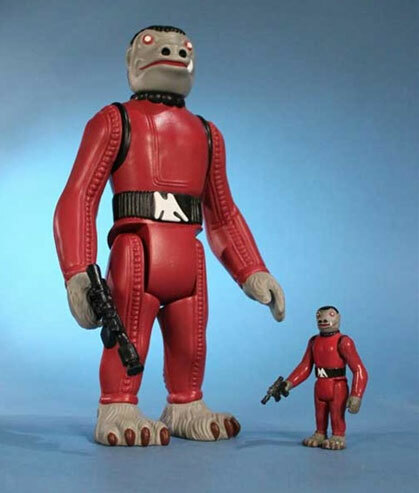 Ben Quadinaros was a male Toong from the planet of Tund, and operated as a Podracer pilot during the last decades of the Galactic Republic. Quadinaros was known as something of a coward, though this was not entirely accurate. However, like most Toongs, he buckled under when confronted with social interaction. His timidity around others quickly earned him an undeserved reputation as a coward, and while he might not have been spineless, he didn't have the skill required to achieve success in the Boonta Eve Classic. Quadinaros had only raced previously on the Pouffra Circuit, widely regarded as one of the safest, and therefore in the collective opinion of the Podracing elite, wimpiest, courses in the galaxy. Now we are talking! 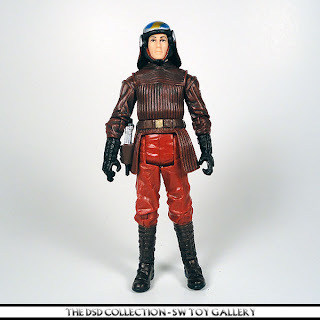 Hasbro is finally putting out the long awaited Pod Racer characters from The Phantom Mence. 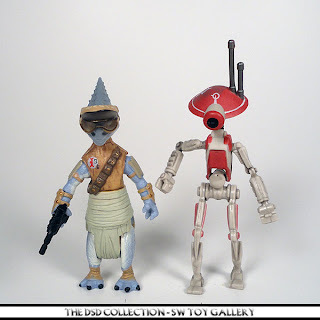 Today's update includes the two pack of Ratts Tyerell and his trusty Pit Droid, Everybody like two figures for the price of one even if we get repainted droids. SW Babes: What if Leia was Blonde? What if Princess Leia was blonde? Would she look like this? How many Star Wars fans would of liked to see Slave Leia as a blonde in the movies? Could be interesting! Leave your comments below. Introduction: In 2003, Hasbro changed up the line and released Clone Wars figures with the same look as the regular figures. Later they went cartoonish, but first we ended up with a short lived line of figures. Durge on a swoop bike was pretty much the best toy of the year. The bike itself was awesome. 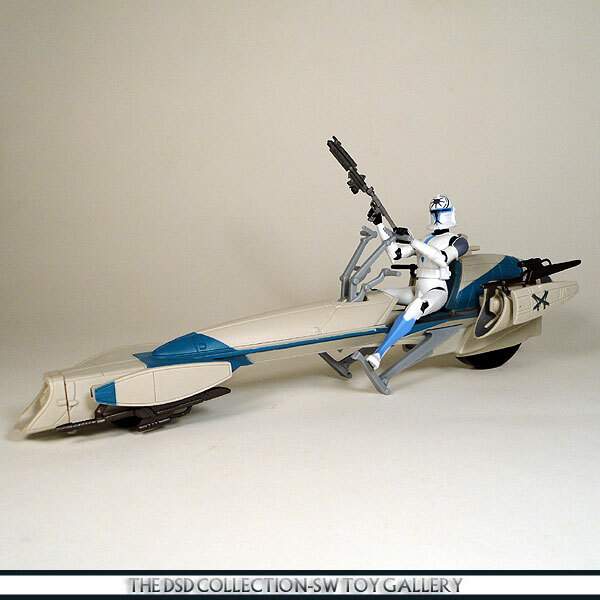 How many of you own this particular speeder? 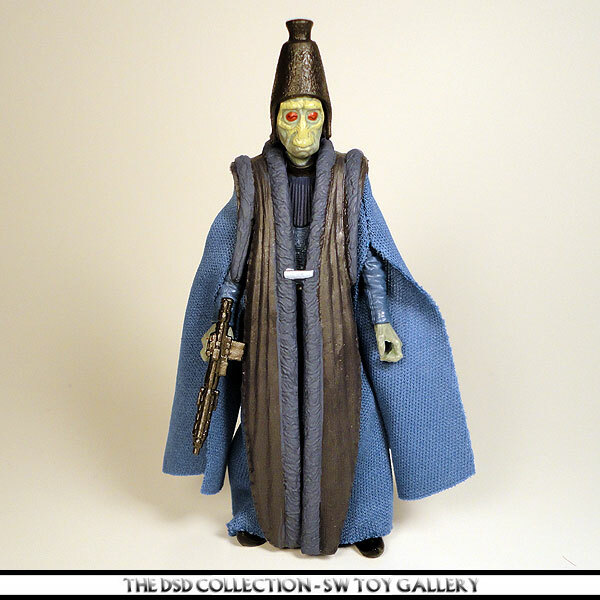 My Opi...nion: Back in 03 my collecting had slowed down some due to other reasons in life so I had passed on many of the Clone Wars collection. I wasn't impressed with this line anyways and definitely didn't like the animated figures either. When I saw this deluxe figure with bike, I definitely picked one up. 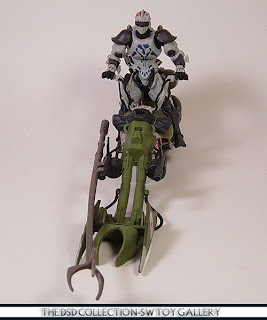 This by far is the best figure and vehicle of the Clone Wars line. "A century before the Clone Wars, this 2,000 year old bounty hunter went into hibernation to recuperate after being tortured by Mandalorians. Awakening shortly after the Battle of Geonosis, Durge learns that the only Mandalorians still alive are the Clone Troopers, which were created from Mandalorian Jango Fett. Durge joins the Confederacy to enact his revenge upon Jango Fett's clones. His swoop bike is a high-performance craft with exceptional speed and challenges even the most skilled pilots. Simple vehicles, they achieve their performance through a combination of repulsor lift and turbo thrust engines. " Vintage Collection Anakin Skywalker as a padawan has been added to the Toy Gallery. This incarnation of Anakin is one of the best to date. Not only do we get full articulation but we get four accessories. The helmet even stays on securely and doesnt fall off like the previous padawan hardhats. Unforenately my sample has a few paint ap drips on the outfit. Quality control seemed to be poor when painting this particular figure. Other than that, I am quite happy with this figure. Click the link below to view the rest of the images. SW Babes: Ride em Cowboy! 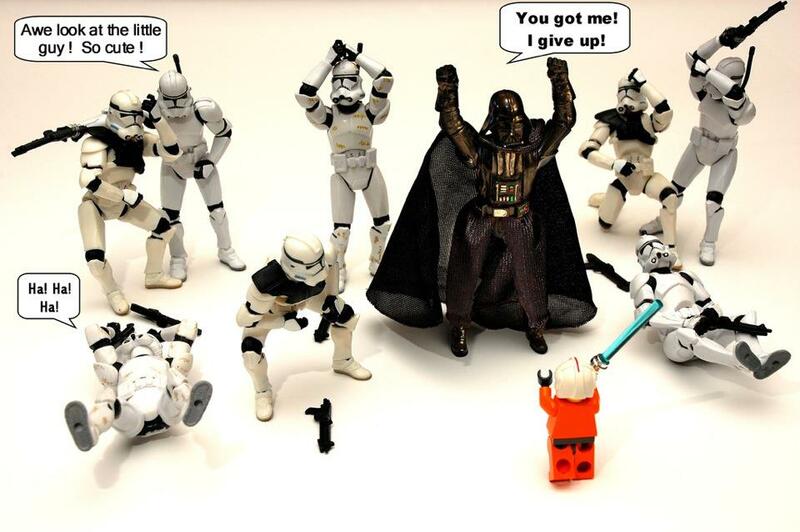 All you need is a Stormtrooper Costume to pull this off. What a lucky clone? Gitty up! Check out this really cool custom X-Wing made out of office supplies. This image was found off the Facebook page of Gadget-o. 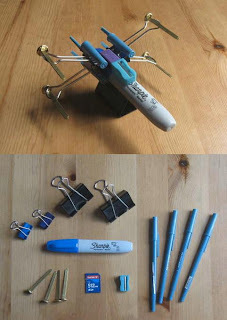 Think of the the Star Wars things you could make out of using your everyday items that are laying around your desks. Click here to view Gadget-o's facebook page. 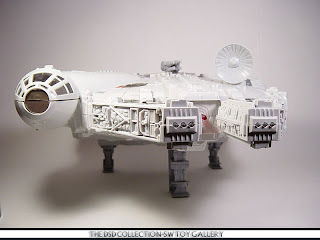 Introduction: In 1995, Hasbro brought back many of the Vintage vehicles from the 70's and 80's. 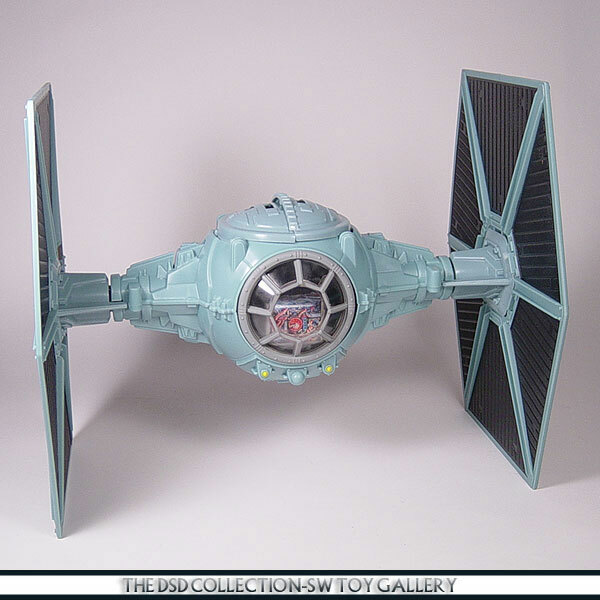 Today's VOTD features the TIE Fighter which was copied from the old vintage version minus the battery compartment. Only this time they updated the Wings and gave us sculpted solar panels instead of sticker applied versions. Remember how bad they looked once the stickers p...eeled off? My Opinion: I was always disappointed with the size of these TIE Fighters. I always wanted a larger scaled wings which now we have today. I didn't really like the idea at first of these vehicles coming back but they did update them to make them better than the old ones. I liked the idea of the blue prints being included but Hasbro quickly stopped doing that after the first round of vehicles. How many of you out there own this particular TIE Fighter? Thanks to PrimeTimeJedi for posting this on Facebook. Its hilarious! 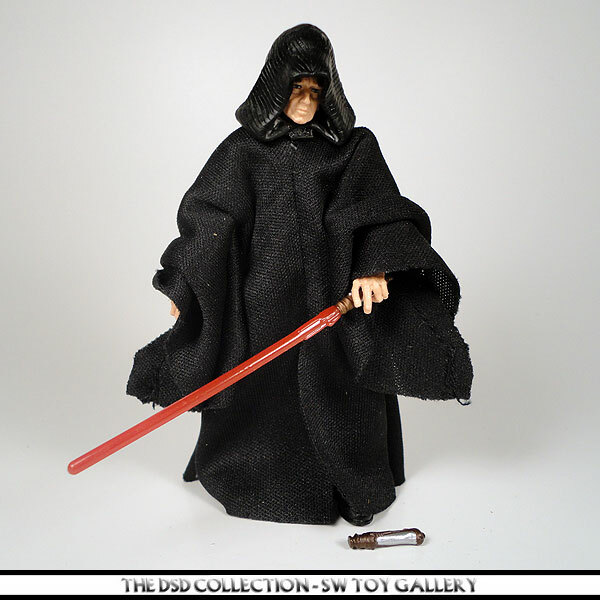 The Vintage Collection Darth Sidious has to be the most impressive figure of this entire wave because of the likeness to Ian McDiarmid. The head sculpt is dead on to the character in the movie. The material used for the robes came out great and looks movie like as far as being just an action figure. If you click the link to view the full gallery you will get to see what Sidious looks like under the robe. Oh don't be alarmed, he is wearing clothes underneath. To top off this figure, it would of been nice if Hasbro added the Death Star plans hologram which he recieved from Count Dooku. All in all, this is a must have figure for any SW collector. Introduction: If you went to Comic Con in San Diego in the summer of 2007 you may remember picking up this exclusive Shadow Scout with Speeder Bike for around $25. They were also available online as well which is where I got mine since I was unable to attend SDCC that year. 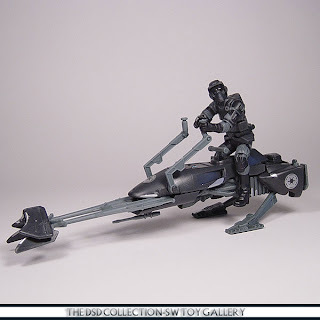 This speeder is all black with the Scout being a retool of 2006's VTSC Bi...ker Scout with a wider stance allowing him to sit the speeder bike. "Shadow scout troopers (a.k.a. storm commandos) are trained for missions of deep infiltration. They uncover plots hatched by shadows in dark corners, and they dig up deadly secrets that can be used to make enemies cooperate. Their speeder bikes are designed for silence and speed, with a tri-deflective energy shield that prevents detection." Finally we get a nice scuplted Naboo Royal Guard. The first release was horrible with its shooting stance. When you put his arms down he looked totally retarded. This time around we get a fully articulated figure. Now if we can only get a few different head sculpts for future releases. By far this has to be the biggest improvement on any figure. What do you think about this figure? Leave your comments below. According to Wikipedia, this figure is named Chamberlyn. Chamberlyn was a male Human who served as a lieutenant in the Royal Naboo Security Forces during the Trade Federation's invasion of Naboo. Chamberlyn became a leader in the resistance against the invader, and was responsible for analyzing and discovering weaknesses in the battle droids. Chamberlyn later accompanied Queen Padmé Amidala in an assault on the Theed Royal Palace during Amidala's bid to retake Naboo, helping her capture the Federation's Viceroy Nute Gunray. Chamberlyn first appeared as an unnamed background extra in George Lucas' 1999 film Star Wars Episode I: The Phantom Menace, portrayed by an uncredited actor. The character received his name in the 2001 Theed Palace Limited expansion of the Star Wars Customizable Card Game by Decipher, Inc. In 2008, Lieutenant Chamberlyn received an entry in The Complete Star Wars Encyclopedia. Would you believe that Hasbro actually repacked this figure just to put it on a Vintage Collection card? Well you are right. 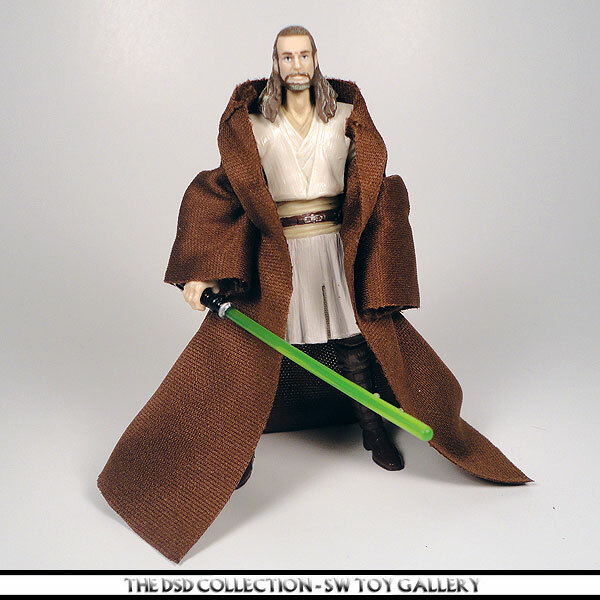 Qui-Gon Jinn is a repacked figure from 2008's TAC Evolutions: The Jedi Legacy set. We already have this figure, why repack it? Let's get a new sculpt if we are going to put it on a Vintage Collection card. Anyways, check out the gallery I put together of this figure. The soft goods robe is very nice and even though the skirt is soft goods as well, this figure does not have the ball joint hips. My Opinion: I really enjoyed having this vehicle in my collection. These ships are massive and look awesome with figures in them. The only one I am still missing from my collection is the Clone Wars black version. I hear it commands a pretty penny these days. I will just wait til the hype calms down and pick one up close to retail if not just a little bit above retail but I will not dish out to much money. These gunships look awesome hanging from the ceiling too. I totally recommend to every collector to at least have one gunship out of the box on display. You wont regret it, this thing is the mother of all vehicles, well next to the BMF its second place in my book as far as air assault ships. "The Republic Gunship is a powerful combat vessel used by the clone troopers. Its transport bay can carry large numbers of troops into battle, deploying them through the side doors and with the drop-off landing base. Outfitted with an impressive arsenal of weapons including "laser" cannons, chin guns and missiles, the gunship is one of the Republic's main fighting vehicles in the Clone Wars. " 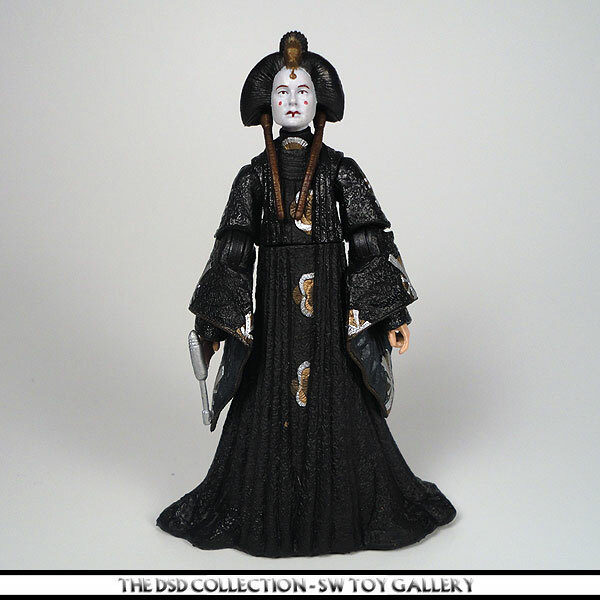 The Vintage Collection Queen Amidala in black travel dress has been added to the Toy Gallery. We all agree that we want Hasbro to make every single outfit in figure form of Amidala but they should at least go the soft goods route. This figure is more like an articulated statue. Even though the elbows bend, the arms look horrible when lifted up. Check out the images that I added of her arms up, she looks like an angel that you stick on top of your Christmas tree. She needed soft good sleeves. 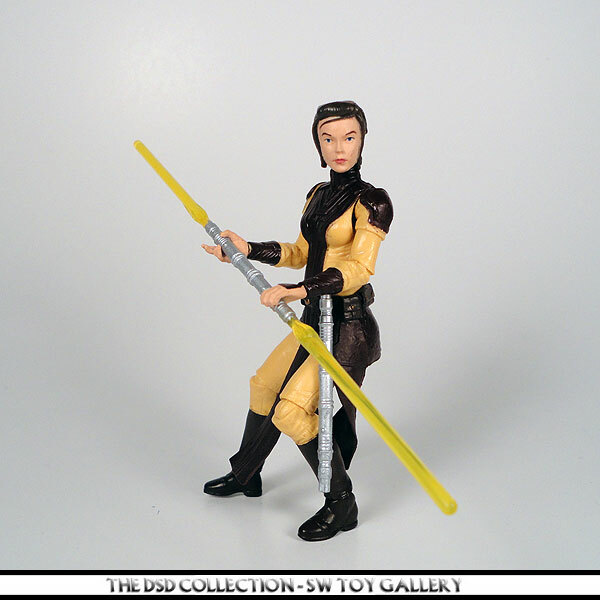 Other than that, this is a pretty cool figure that we definately want to add to our Padme collection. 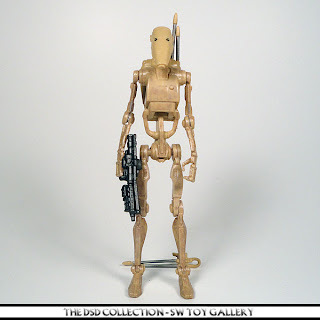 The newest Battle Droid released on the Vintage Collection card has been added to the Toy Gallery. This is by far the best incarnation of the Battle Droid. 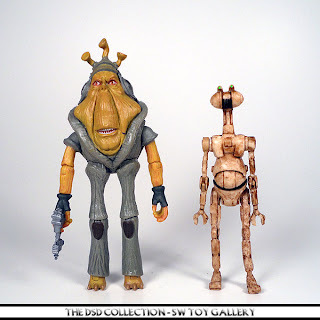 Hasbro has tried over the years to make a better Battle Droid than the Episode I version. In my honest opinion, none of them were better than the first release in 1999. Although they looked better, none of them could stand on their own. This new one can actually stand up without the use of a stand. So I would have to say Hasbro finally nailed this one. You also get a choice wether you want your Battle Droid to sport a backpack or just the antena. A battle droid (also referred to as war droid or killer droid) was any droid designed for combat. Daultay Dofine has been added to the Toy Gallery. Check out all the images I added. This figure is an all new figure which we have been waiting for to add to our collections. Hasbro did a great job with the articulation and soft goods. The sleeves are a nice touch. They should of used the same material and design for the Darth Maul figure released in this wave. Out of the package the sleeves are tucked behind the plastic scarf. The side shot I took are straight out of the package while the front and back shots are after I pull the material out. This is a must have for every collector. Hunt one down today! "Daultay Dofine was the Neimoidian captain of the Trade Federation Lucrehulk-class battleship Saak'ak during the blockade and invasion of Naboo. Born to an influential family, Dofine quickly rose through the ranks of the Federation, utilizing a combination of backstabbing and family ties. He quickly made a reputation for himself in the Outer Rim Territories as a harasser of traders and a hunter of pirates. By 33 BBY, he was the commander of the Federation cruiser Revenue. 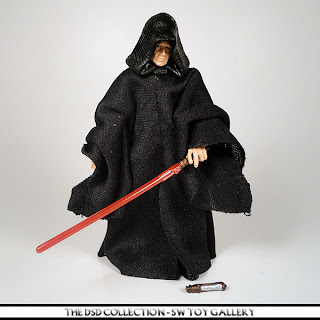 Today's Toy Gallery update features the latest Darth Maul figure from the Vintage Collection series. 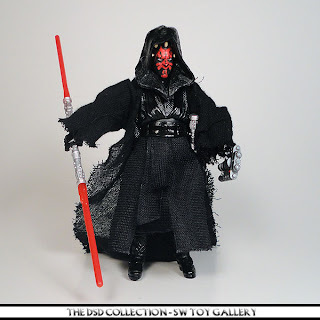 This is an all new figure for Maul and not a repack. There are some goods and some bads with this release. The good is that the detail on the face and head are outstanding along with the articulation. The accessories are also a nice addition for an ultimate Maul. However, the cloak and hood are sorry. The cloak is garbage because its frail and looks like it was found in the trash. I know Hasbro could of done better than that. Although the hood is kind of cool, it is still too big and still shows his horns. Other than that, this is definately the best Darth Maul to date. Don't pass this one up! Back of card: "Celebrate the legendary Star Wars saga that changed the universe forever! This collection brings to life the incredible story of good versus evil that captured our imagination and took us to a galaxy far, far away. Iconic Star Wars heroes and villains are captured with incredible detail and premium features to commemorate each epic tale in the Star Wars saga. 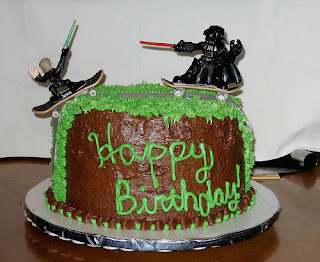 May the Force be with you!" 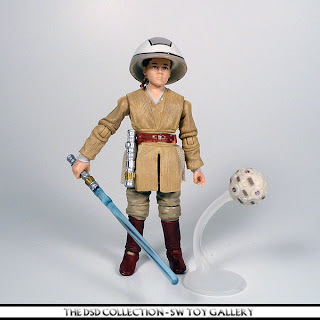 Introduction: Hasbro has put out many BARC Speeders lately, so today's VOTD features the one that includes Jesse the Clone Trooper with a black logo on the front of his helmet. This speeder looks like it could of used a rip cord and is on wheels. Maybe it has been gutted, maybe an old ripcord will make it go. Who knows? My Opinion: Personally I have passed on most of the BARC Speeders but I am impressed with their look. After opening this one, I want to go back and get all of the previously released version including the very first one from the ROTS line. I think that one had a ripcord. How many of you actually found this version with Jesse? 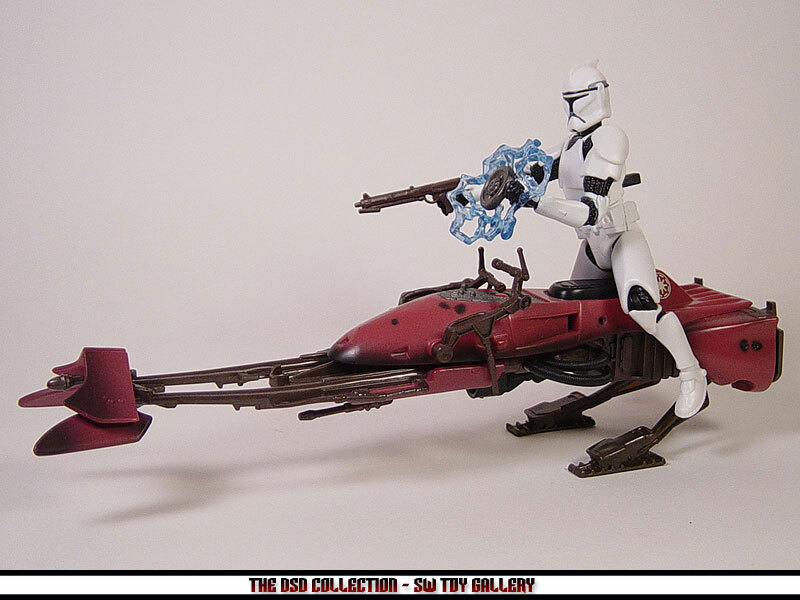 "Clone trooper Jesse pilots a BARC speeder bike to track down General Grievous in the Saleucami wetlands. The one-man bikes are named for the Biker Advanced Recon Commandos who first used them. On the swift, maneuverable BARC speeders, Jesse and his team can cover a lot of ground as they search for the cyborg general." 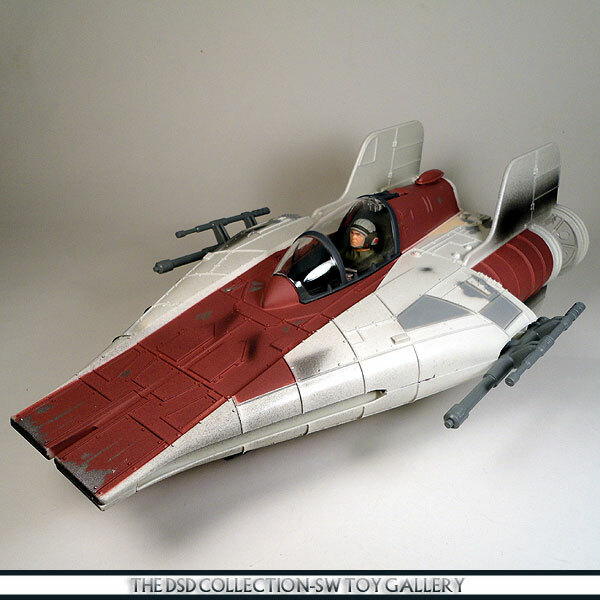 Introduction: Today's vehicle of the day features the Original Trilogy Y-Wing Fighter which is the same sculpt as the POTF2 version, which was the same mold used as the Vintage version minus the battery compartment. 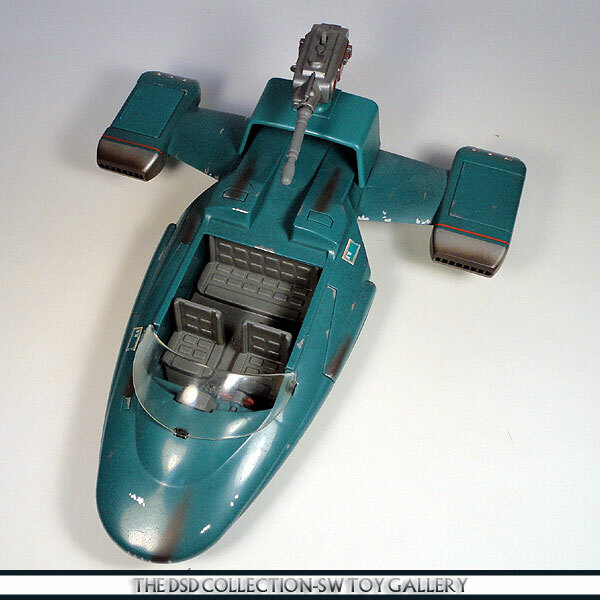 The color marking were never seen in the movies, but were used on an Expanded Universe version of the Action Fleet vehicle. My Opinion: I personally n...ever saw this in the stores back in 2004 but I did get mine from fellow collector RogueLeader from Japan while he was stationed there. He found this on clearance at ToysRus back in 2006. SO essentially I got mine 2 years after its release. I like how Hasbro used the Action Fleet colors on a 3 3/4 Y-Wing. I had fun during the photography of this ship because the inside package made a great diorama image. The fast moving Y-Wing image was no trick photography, it was just the simple background of the box. Simply amazing! Do not throw that away when you open yours. How many of you own this version of the Y-Wing? "Y-wings are durable, reliable starfighters that excel in close-quarters combat. During the battle of Yavin, Y-wing squadrons were influential in helping to defeat the Death Star threat. Designated attack fighters, Y-wings went one-to-one with imperial fighters as the Rebels attempted to reach the battle station's vulnerable exhaust port. Jon "Dutch" Vander was Gold Leader of the Y-wing Gold Squadron during the Battle of Yavin, fighting bravely against the powerful Imperial forces." I have returned with a brand new Toy Gallery Update featuring Quinlan Vos from the Vintage Collection series. Many of you may have noticed that I have taken a break from photography of my collection but now I am back with a lot to catch up with. I randomly picked this figure to start things off. As you can see mine was unpunched so yes it was hard to open. Well not really! I open my figures regardless of card condition since I am an opener. Well enough about me, check out the latest gallery of images I have put together. Quinlan Vos was a Kiffar Jedi Master in the Jedi Order and a General in the Grand Army of the Republic during the Clone Wars. He hailed from the planet Kiffu in the Inner Rim Territories. With long, dreadlocked hair and a band of pale yellow across his upper face, Vos was gifted with psychometric powers which allowed him to "read memories" from inanimate objects through physical contact. Vos had an ongoing struggle with the dark side of the Force, particularly after he sustained recurrent amnesia after he overdosed on an illegal drug administered by an enemy shortly after the Battle of Naboo. The Sith Lords Darth Sidious and Darth Tyranus both showed an interest in him. He was a prominent participant in the Clone Wars, one of the few survivors of the Great Jedi Purge and, with his lover Khaleen Hentz, conceived a son named Korto Vos. Introduction: The A-Wing was always a fan favorite since the original vintage version was released during the Droid era and when most collectors grew out of Star Wars to start playing video games. Therefor, many of us missed out on this awesome ship. A decade later, the POTF2 line was born and eventually produced an A-Wing early in the line so many collectors wer...e finally able to own one. 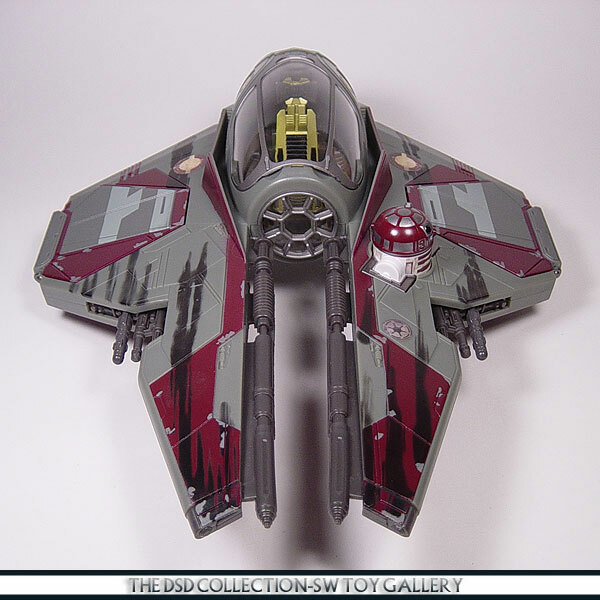 My Opinion: Since I didn't have an A-Wing as a kid, I was stoked to get the POTF2 version. However, I didn't start collecting again until 1999. You can bet that this ship was one of my top choices. It only took me a year to get caught up on every Star Wars figure and toy made from 1995 to 1999. I accomplished most of that through trading with other collectors. To bad the new incarnation didn't come with the original electronics though because it does have the battery cover on the bottom still. 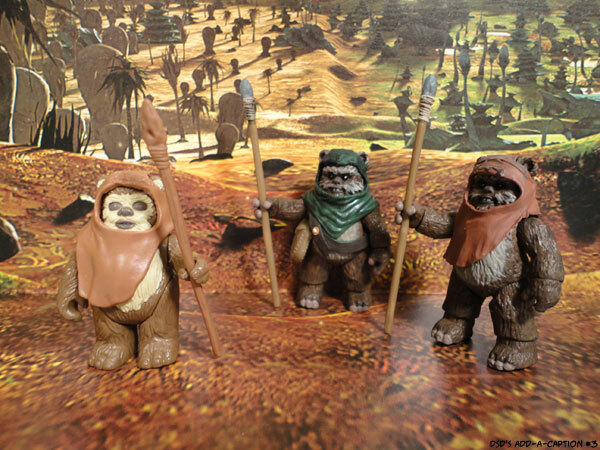 Introduction: Back in 1998, Hasbro Inc. still used the name Kenner on their Star Wars products and gave collectors their first Expanded Universe vehicles. 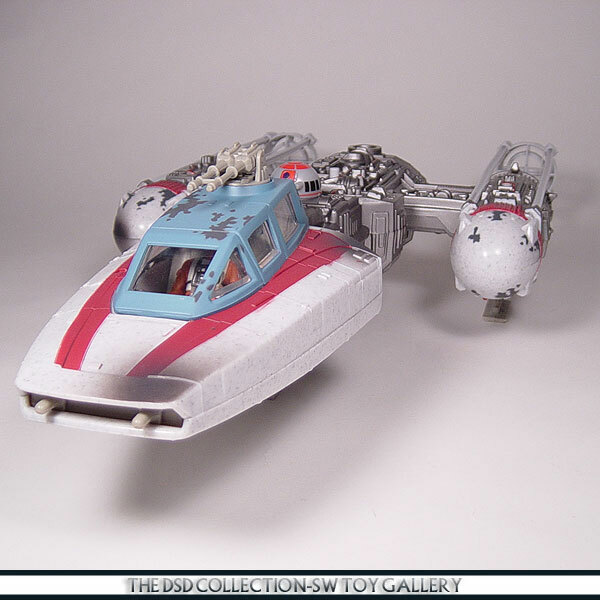 Today's VOTD features the Cloud Car created from the art work of Ralph McQuarrie in toy form along with a Cloud Car Pilot which both look nothing like the ship and character used in the movie, ESB.... Hasbro released a total of 3 different vehicles under the EU realm, all which are pretty cool looking toys. My Opinion: At first when these vehicles were released I had no interest in buying them because there were not seen in any of the SW movies. I didn't get any of them for a few years, not my passion for SW toys is to get everything Hasbro makes minus rehashes of course. Now that I look at this Cloud Car, I think the design in toy form is excellent. However, the orange color is overkill. If they re-did this ship in more realistic colors it might make for a great re-release. How many of you collected the EU vehicles? How many of you still have them in your collection? "Cloud cars are atmospheric vessels that employ both repulsorlifts and ion engines, filling the important gap between airspeeders and starfighters. Functional in many ways, twin-cockpit, patrol cars escorted the Millennium Falcon and her crew onto Cloud City during The Empire Strikes Back. It was here that Darth Vader had Han Solo frozen in carbonite while Princess Leia, Chewbacca, and C-3PO were held prisoners of the Empire. This single cockpit cloud car was designed and built based on production sketches found in The Art of Star Wars; its brainchild was renown Star Wars artist, Ralph McQuarrie." Assault Wings &Movable Air Foils deploy during attack mode. Open Cockpit and Pilot takes the controls. I have to say that this is probably my favorite Add-A-Caption so far. From here on out I will br creating brand new images for everyone to add a caption to. So let's see what you got. 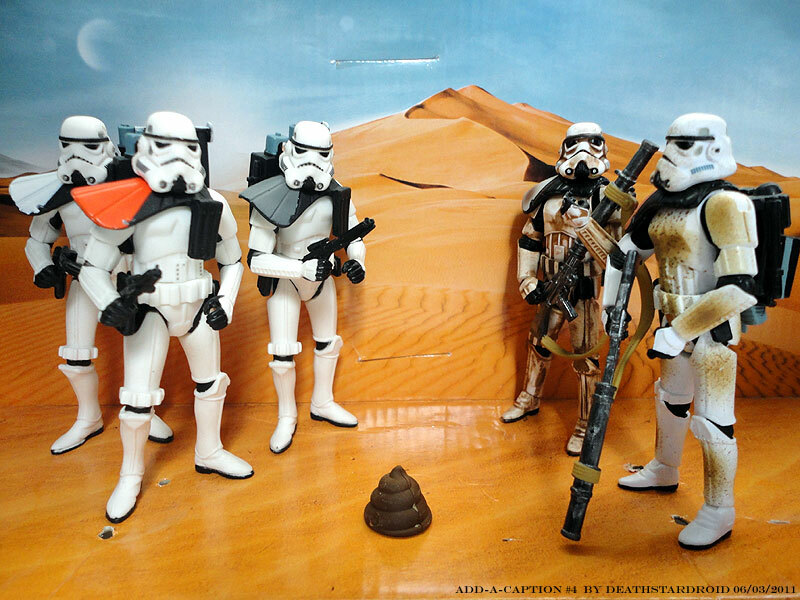 Come up with your best add a caption comment for this image of Sandtroopers searching for the missing droids. Look what they have found. Please leave your response in the comment section below and dont forget to subscribe to my page as well to the right. Thanks for looking! SW Babes: Just another day in paradise! What happens when you put together your two favorites things in the world? Yes, you guessed it. Your Star Wars figures and a nice looking babe! Check out today's image find featuring a relaxed 3 3/4 Stormtrooper and his newly aquired sofa. Although we have no idea what her name is, he is definately looking good enjoying the sun in style. This image was found on facebook this morning. Im not sure who it belongs too and Im sure nobody cares at this point so lets just click on this picture and check out that figure. Be sure to leave a comment and subscribe as a follower located to the right. Keep an eye out for more of these random images in the future only here at DSP.net. DSD's Add-A-Caption #3 - Yub Yub..
What is going on in this image? Do you have any ideas or thoughts you wanna share? Feel free to leave a caption in the comment section below and share with us your funniests caption. I will be adding more of these fun type images soon. Be sure to share and like this topic. Also I if you havnt already, subscribe as a follower and show your support for DSP.net. Thanks for looking! 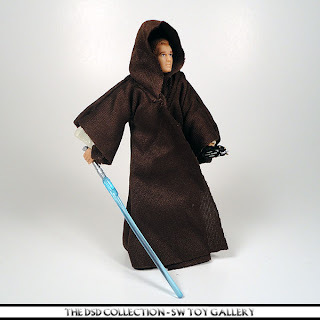 Introduction: It was 1999 when Star Wars: The Phantom Menace hit the big screens and Hasbro produce a wide variety of new action figures and toys. Among all of the initial toys that were released came this sleek looking Flash Speeder. Everyone loved the old landspeeder so why not make a modern or shall I say older model. 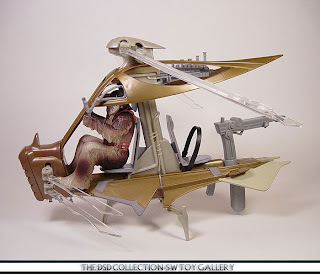 Although this speeder has a nice look t...o it, the seating arrangement is not very good as you cannot fit a figure in the back seat. There is no leg room. "Among the large landspeeders used by Naboo's Royal Security Forces, the Flash Speeder became an important component in the fight against invading Trade Federation forces. This heavily armed surface transport helped Captain Panaka and his volunteer resistance defend their beloved capital city of Theed." Here is an image of my Add-A-Caption series. I took this image a few years ago but since it was my second one I decided to post it up again in order. All you have to do here is leave a comment with your best add a caption response. Let's see how funny you are. I simply put a Clonetrooper on a Hot Wheel scooter that I picked up a few years ago. 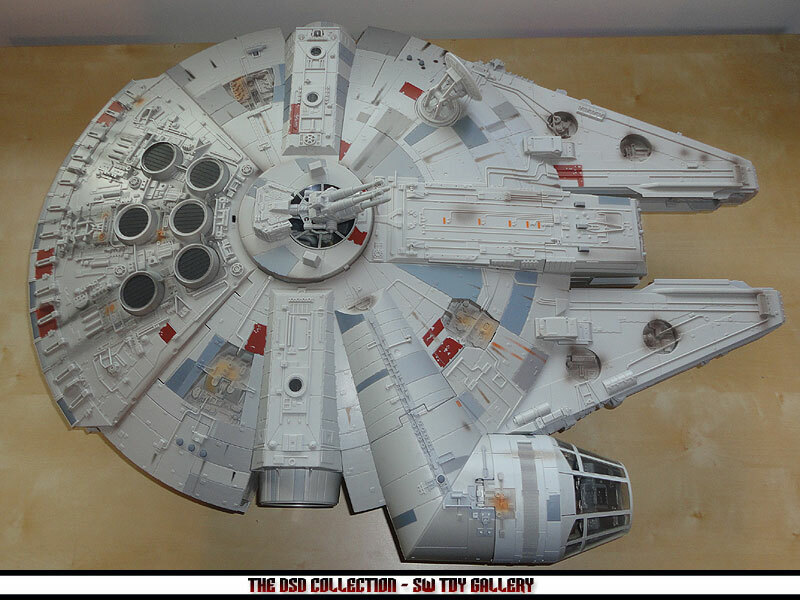 Introduction: The Millennium Falcon has been re-issued many times over the years using the vintage mold. Each time Hasbro released this vehicle, they added something new and packaged it in the current style box at the time of its re-release. Today's version was released in ROTS style colors back in 2005 and was updated to include rear thruster ...light up electronics. Check out the gallery to view these changes. 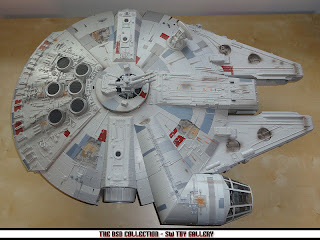 My Opinion: I picked this Falcon up back in 2005 and to this day I have yet to see anyone else include this particular version in their image galleries. 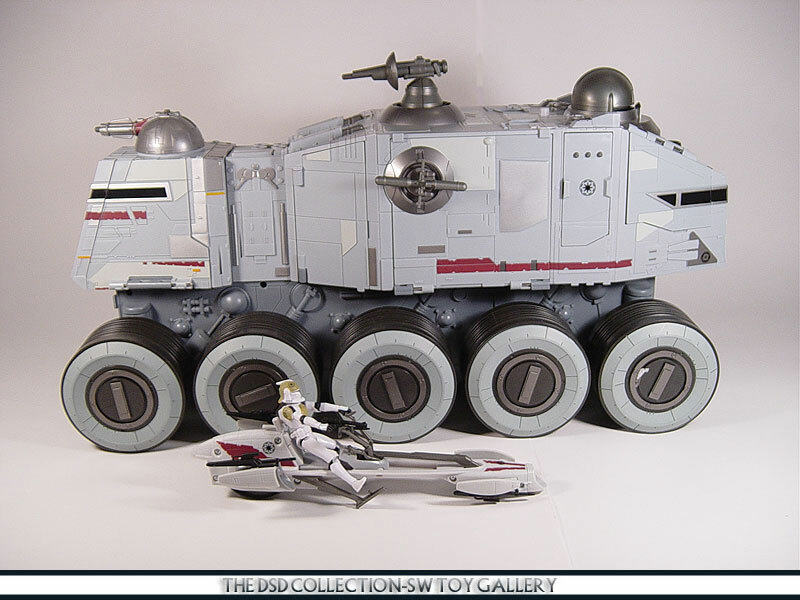 It would of been nice to see other collector's images of this large vehicle. The box was quickly change to resemble the OTC line which was a more common box to find. I had a lot of fun when I photographed this ship but keep in mind I shot these photos back then with a weaker camera which explains why the box shots are little fuzzy. How many of you picked up this release? 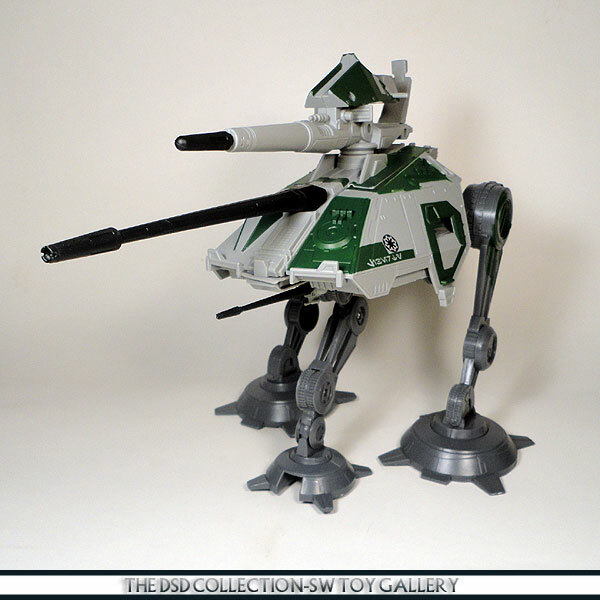 Introduction: With the Revenge of the Sith movie out, Hasbro did a few battle type vehicles. This one was called the Wookiee Flyer which features a Wookiee figure that is not very poseable. We get a sitting furball in a funny looking stance. 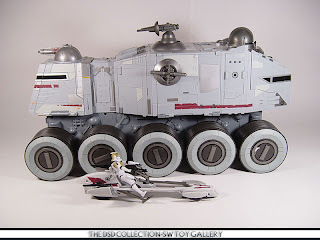 This vehicle was one of 3 different battle size vehicles under the ROTS packaging. My Opinion: Personally, I think this thin...g is horrible. I was disappointed in this toy all together from what it is to the boring figure included. 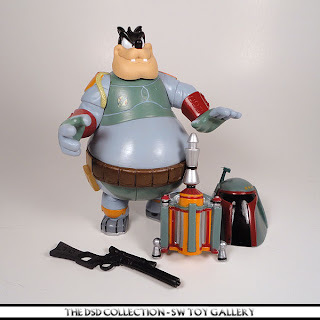 Why couldn't we of got a figure that was full poseable? This is my least favorite toy in my collection. Just plain worthless, in fact I didn't even like seeing these in the movie. Thumbs down on this thing, just plain weak. How many of you own one of these things and does anyone have more than one in their collection? "Wookiee warriors use their special assault flyers in battle to attack the enemy from above. Swift and highly maneuverable, the assault flyers swoop down to launch a powerful strike on invading ground forces. Take to the skies with the Wookiees and let the battle begin! " 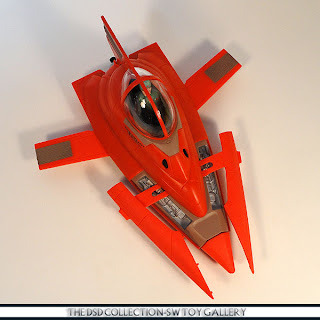 Introduction: Hasbro introduced everyone to a new breed of attack ships with the new incarnation of the Jedi Starfighter. Today's VOTD features Obi-Wan's version. This sleek new ship has many features hidden within the wings from attack mode to missile launchers. Hasbro went backwards a little bit by going with the stationary Astromech unit inst...ead of allowing us to put our own Astromech droid in the socket. However, they met us half way on the matter. You can pull the plastic dome out of the ship and place your own but it will only sit in the socket halfway. My Opinion: At first I was not to fond of this style of ship but eventually these starfighters grew on me. Now I like them so much that I want to get every variation of them. My biggest complaint though is the droid socket. Hasbro didn't make the location deep enough to put a regular astromech droid in there. Other than that, I think this ship is a nice welcome to the Star Wars universe. "Obi-Wan Kenobi battles deadly droid fighters while on a mission to rescue Chancellor Palpatine, who has been kidnapped by Separatist forces. As he heads for the vessel on which the Chancellor is being held, buzz droids attach themselves to his starfighter to destroy it."